The 2018 dahlia blooming season has begun, and along with it the Dahlias For Seniors 2018 fundraiser for the Shoreline - Lake Forest Park Senior Center. My tubers went into the ground on the first Saturday in May, and with the exceptionally warm, sunny Spring we had they are a few weeks ahead of schedule. Most of the 110 plants are between 3' and 5' tall and the large majority are producing many healthy buds. About 20 varieties have first flowers, with more opening each day. The first 2018 Dahlia of the Week is one of my favorites, last year's champion bloomer -- Baron Katie. Baron Katie was first introduced to dahlia lovers in 2000. This is a magnificent plant, with more sturdy side trunks growing from the lower main than any other I've seen, each of which produces smaller uprights and many blooms. Her red-orange-yellow petals make a 'flame blend" as they gracefully curl inward at their sides and twist on the long axis, making an impression bright, luscious and relaxed. Thus Baron Katie is classified Informal Decorative. Her flowers are 5-6'' across, officially sized BB and middle-sized for a dahlia, presenting strongly upright on dependably long, strong stems. Structurally perfect for cutting, her color and shape last very well in a bouquet. 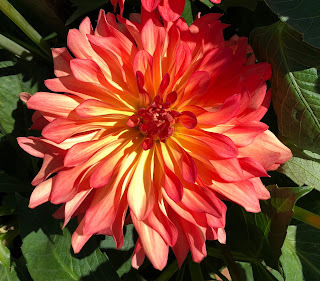 A backbone of the Dahlias for Seniors bouquets, I planted two clumps this year! You can pick up a bouquet in exchange for a donation at the Ridgecrest Public House 520 NE 165th St, Shoreline, and enjoy nice folks while you are there. And this year, for the first time you can pick up a bouquet at the Shoreline - Lake Forest Park Senior Center, the beneficiary of our most-colorful fundraiser. Located on the NE corner of 1st Ave NE and 185th NE in Shoreline 18560 1st Ave NE, Shoreline 98155) the Center would love to have you drop in for flowers and see what they're up to.